Here’s an example of how not to make the donuts. A Dodge Charger caught fire while doing donuts for a crowd at a car meet in Anaheim Monday morning, reports KTLA. Around 50 to 100 people were there at this unauthorized meetup and standing way too close to cars doing stunts, including this one that burst into flame. The final car went to do his spins and “right away smoke comes,” Guzman said. The driver parked the car and tried to use a fire extinguisher on the vehicle but there was too much smoke. Everyone then ran from the car shortly before it burst into flames, Guzman said. Look, we love donuts here, but let this be a cautionary tale of what not to do. First off, any meetup that involves both stuntin’ and splodin’ probably needs the blessing of the owner or manager of whatever property you’re on. That person likely doesn’t want to be responsible if one of you jabronis loses control worse than That Mustang Owner at Cars & Coffee, nor do they probably want your abandoned, burnt-out husk of a car. Secondly, I’m not going to go all “think of the children!” on you guys because you’re probably not children, but you really shouldn’t be doing donuts that close to other people. Have some common sense. The fire was clearly not intended to be part of the stunt, but appears to have been some kind of mechanical failure. The Anaheim Fire Department was forced to put out the blaze after the crowd bailed on the scene. 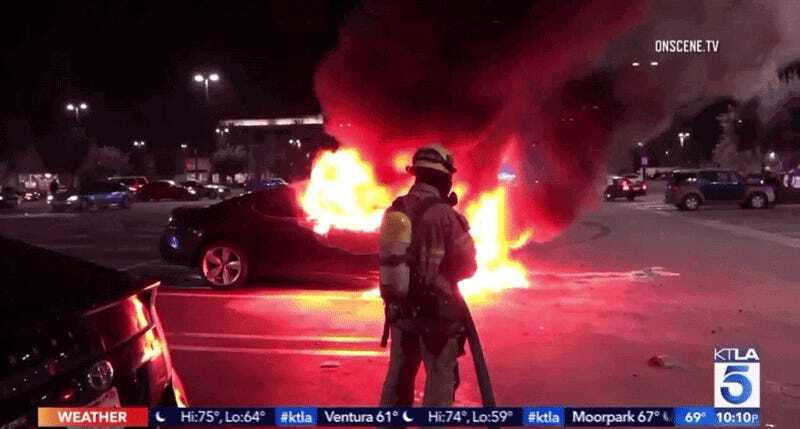 Police were still looking for the car’s owner as they abandoned the car shortly after the car caught fire, and were unsure if the Charger was stolen, per KTLA. If it is stolen, this would tick just about every single box on How Not To Hoon.